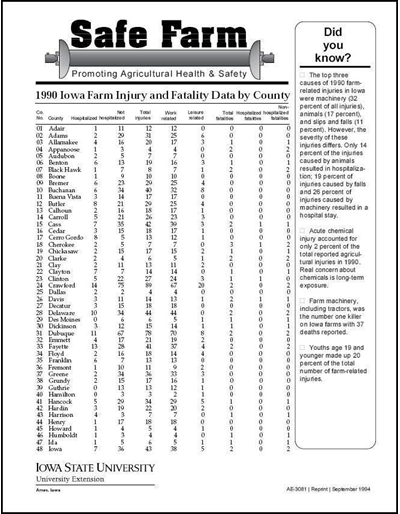 Injury and fatality data are listed by hospitalized or not hospitalized, and work or leisure related. Recommendations and instructions on the use of reflective and fluorescent tape to increase visibility of farm vehicles. Injury and fatality data are listed by hospitalized or not hospitalized, and engaged in production or present during production. 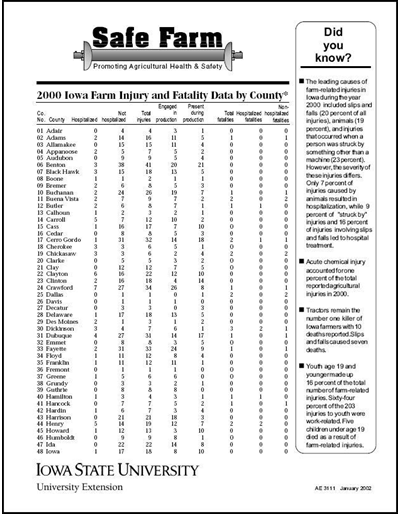 About one out of every four injuries on the farm involves animals. Learn about animal behavior related to habits, social relationships, maternal instincts, and territorial behavior. 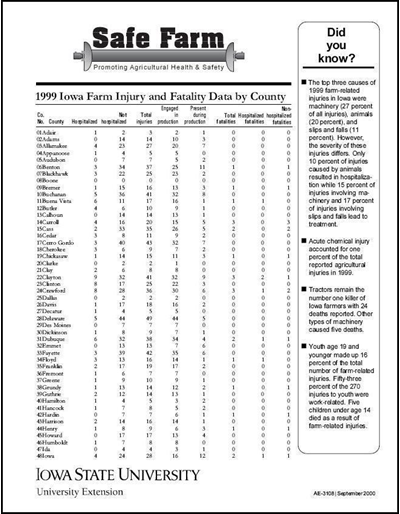 The most serious injuries and fatalities on the farm involve machinery and equipment. 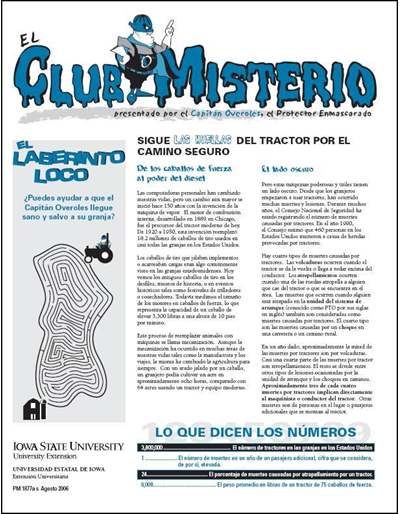 This publication deals with danger points on agricultural equipment, those areas that can entangle, pinch, crush, or shear clothing and limbs. 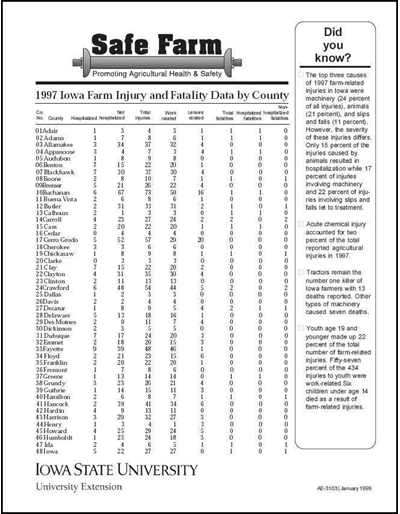 Tractors are common to all farm operations and are the major cause of death in agriculture today. Rollover protective structures are cabs or frames that provide a safe environment for the tractor operator in the event of a rollover and are designed to prevent death and minimize injury. 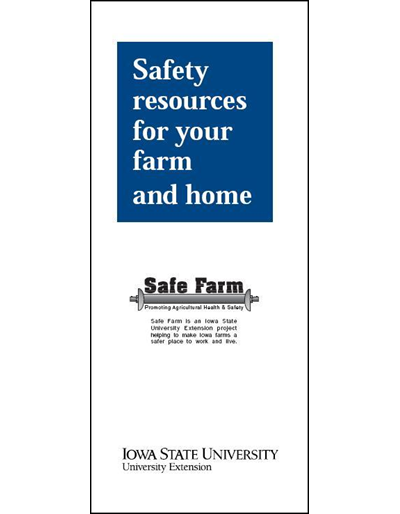 Here’s help to review family farm safety rules. 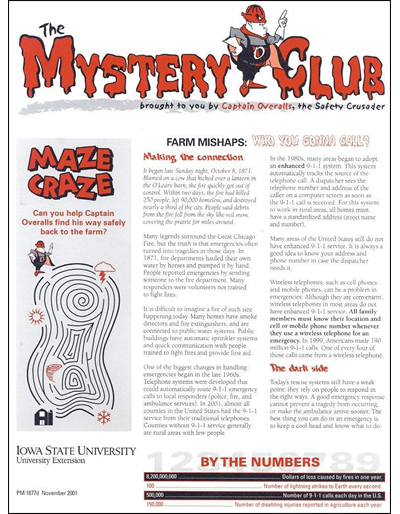 Discussion includes the farm environment, designated play areas, identifying hazards on the farm, and how adults can model safe behavior for their children. Farm operators often overlook dangers of handling grain. 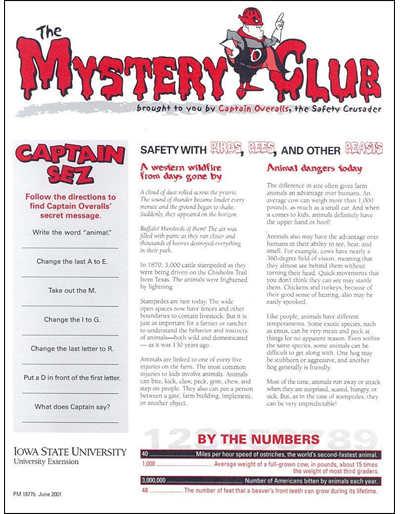 Read about hazards and prevention techniques. Transporting agricultural equipment on public roads can be dangerous. 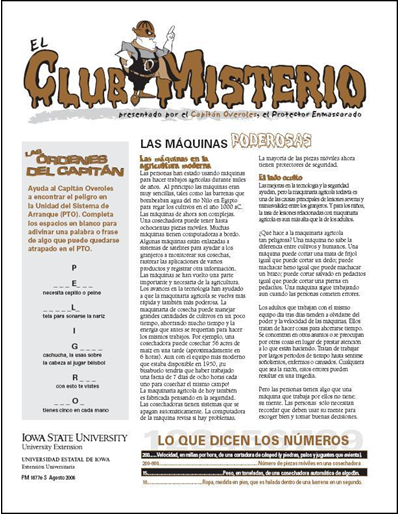 Learn about emblem use, laws, and maintenance. Farm workers can reduce their risks of electrocution by knowing how they can unknowingly come in contact with electricity. This publication focuses on electrical hazards posed by overhead power lines, standby generators, and general operating procedures of electrical systems. Farming often is listed as one of the most stressful occupations. 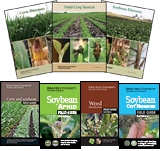 This publication will help you recognize things many farmers consider stressful, common symptoms of stress, and effective ways to manage stress. 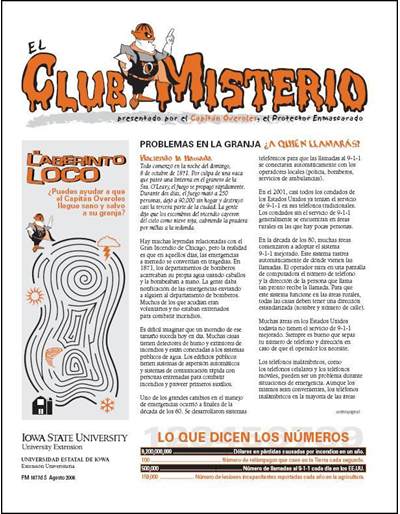 This publication discusses serious risks for extra riders and suggests how to eliminate those risks. Here's a look at anhydrous ammonia -- ways Iowans are exposed to it and how to avoid these situations, its properties and first aid treatment, as well as Iowa regulations regarding its transport. 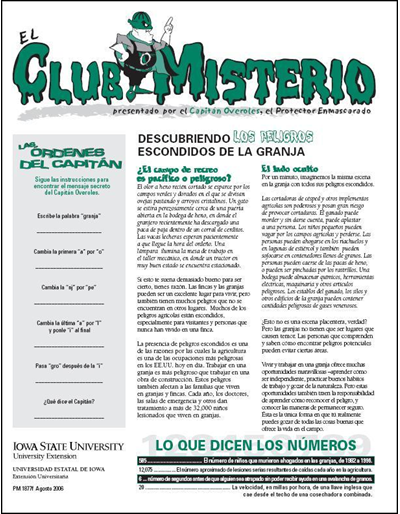 Safer working conditions provided by state and federal child labor laws protect Iowa's youth. Know the laws. This publication reviews common hazards posed by the harvest and handling of large round bales, and suggests procedures that can reduce those hazards. Here are some general guidelines for adults to use when providing supervision, assigning chores, and teaching about safety in ways that are appropriate for a youth's age and abilities. Information on when to consider protecting your hearing, and how to do it. 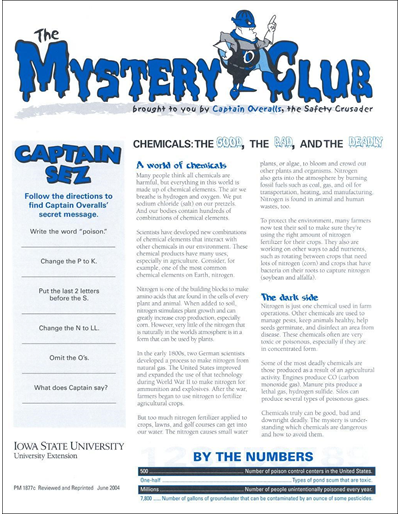 This publication discusses five common gases found in manure storage facilities, and other hidden dangers. 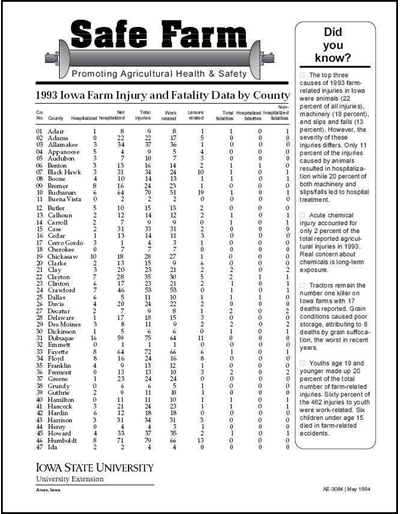 First response is critical in farm-related injuries. Learn what to do in several different injury scenarios. 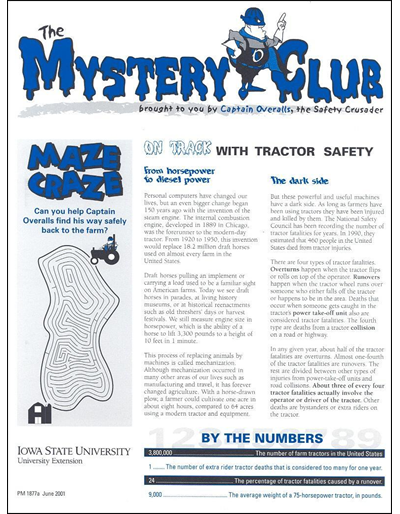 Brief discussion of ATV safety concerns, including the need for protective gear, a pre-ride inspection, and proper operation. 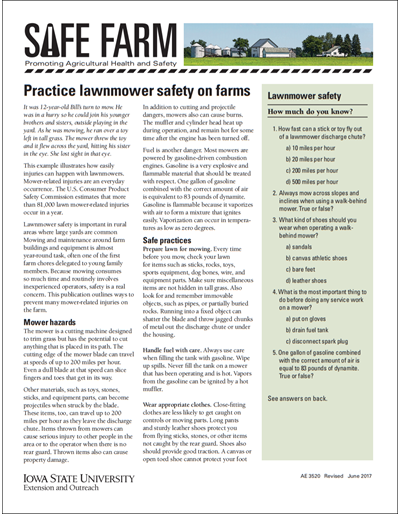 Learn five safe practices for lawnmower safety, including safe mowing techniques. 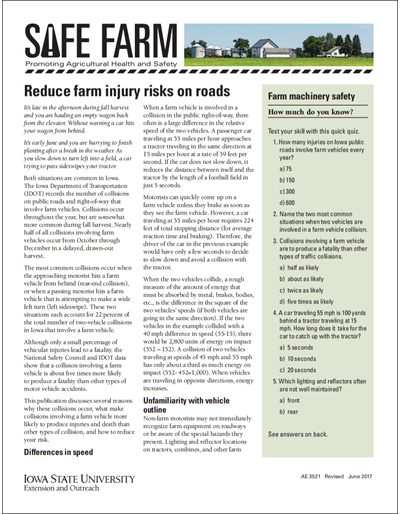 Learn ways to avoid accidents when transporting farm equipment on public roads. Iowa law requires wells abandoned since April 1990 to be plugged within 90 days of abandonment. Find out more here. It's recommended that you test well water for coliform bacteria and nitrate at least once a year. Check out the details. Information on dealing with tornadoes, winter storms, excessive heat, and thunderstorms. 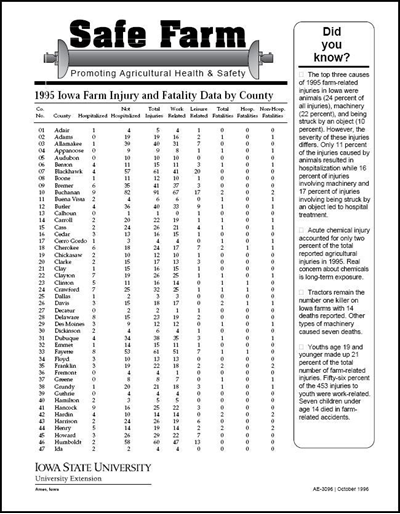 Protect yourself and others with the facts about injuries from farm equipment. 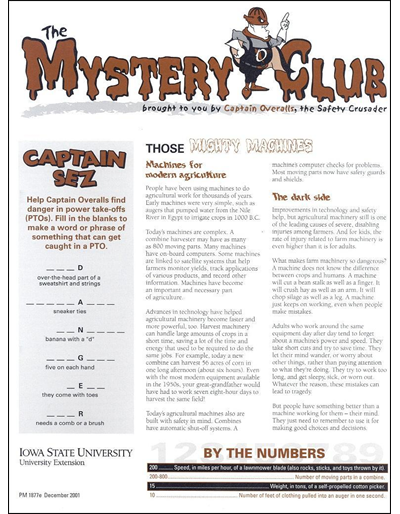 Compare human limitations to machinery speed and power, learn safety hazards, and get tips for safe machine operation and clothing safety. Here are tips on dealing with a medical emergency on the farm, plus detailed items to have in specialty first aid kits. 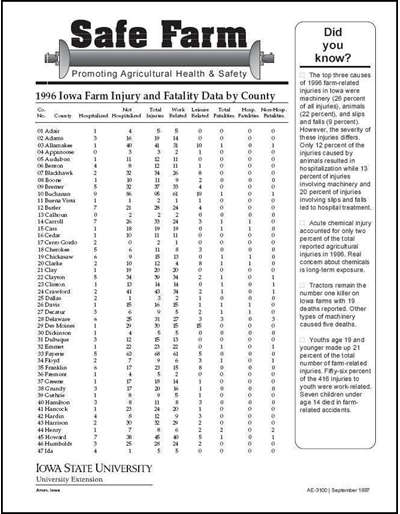 Learn how a child's typical developmental milestones affect farm safety. Exposure to grain dust, molds, pollen, animal dander, soil dust, welding fumes, and diesel exhaust can lead to serious respiratory problems. Find out how to reduce your risks. 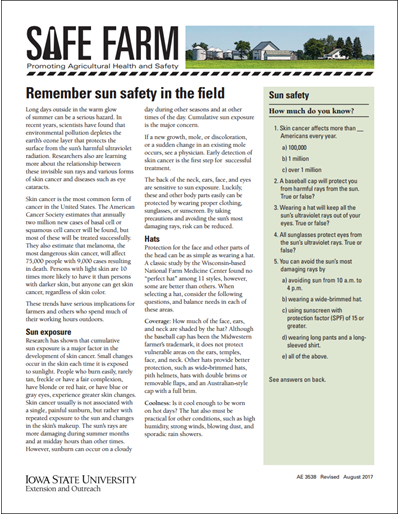 Learn more about sun exposure and ways to reduce your risk, with hats, clothing, sunscreen and sunglasses. 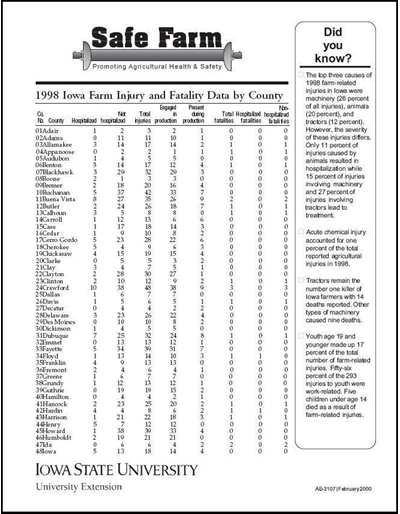 Agricultural injury data show a high proportion of cases that involve farmers 65 years of age or older. Find out how to recognize age-related risk factors and modify activities to be safer. 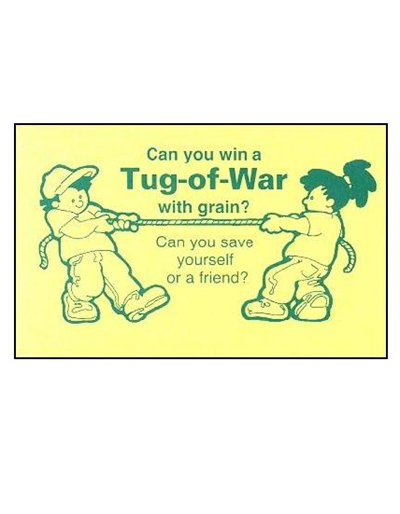 Card to hand out with Tug-of-War with Grain display. 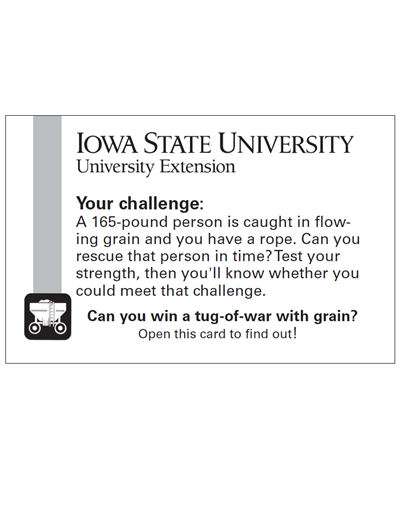 Weight card for kids used with the mini tug-of-war with grain display. 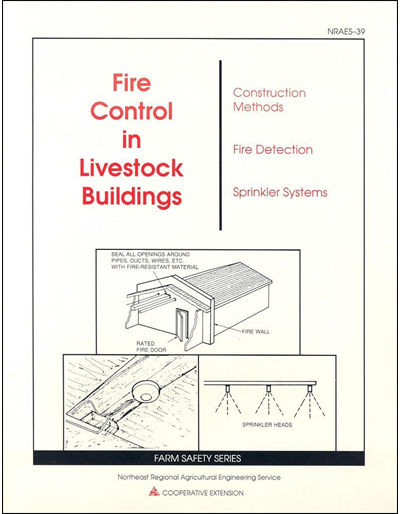 Information to ensure that livestock buildings are constructed and equipped to minimize fire danger is presented in this two-color, illustrated guide. 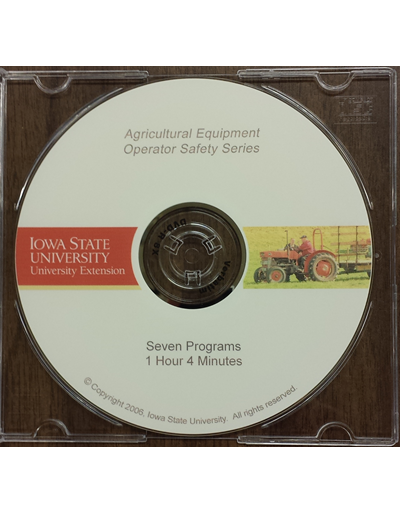 Training employees who operate agricultural tractors is important. All operators should be informed of the nine safe operating practices presented in this publication. 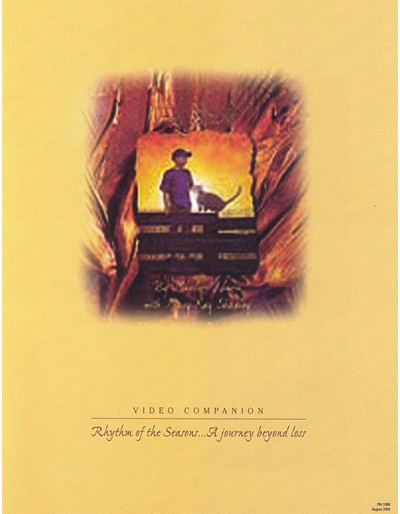 WWW only. The best defenses against well contamination are good construction, periodic inspection and maintenance, and regular water testing. 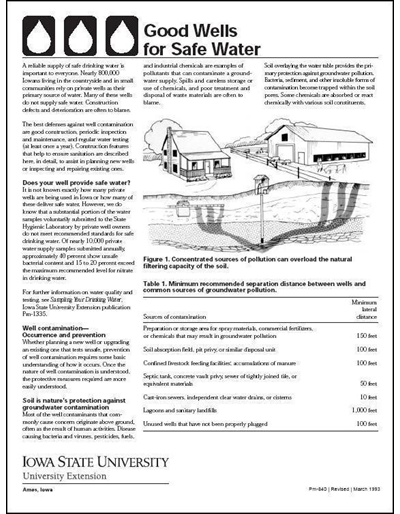 Detailed construction features are described here to help you plan new wells or inspect and repair existing ones. 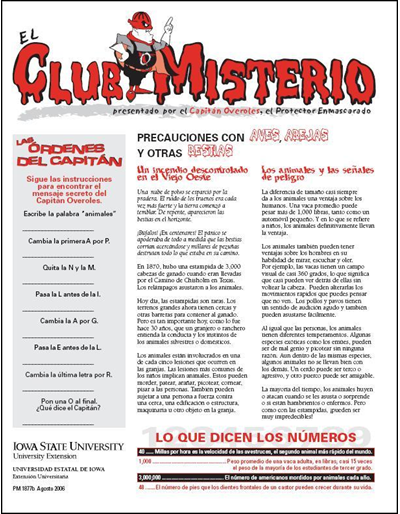 This flyer lists more than 100 publications on safety, also videos, displays, online resources, and programs. 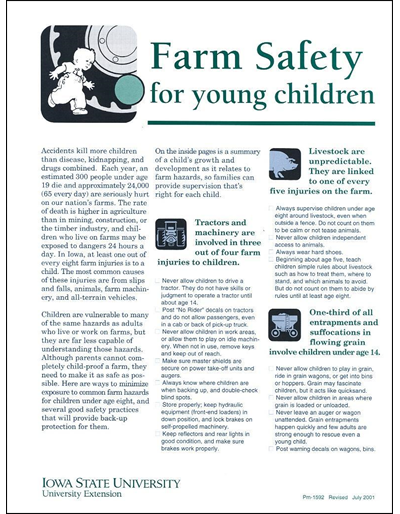 Details on a child's growth and development as it relates to farm hazards, so you can provide appropriate supervision. 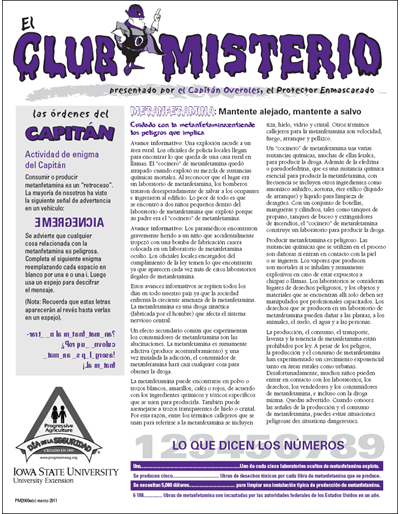 Read about carbon monoxide poisoning as well as symptoms, poison prevention, alarms, and possible sources inside the home. 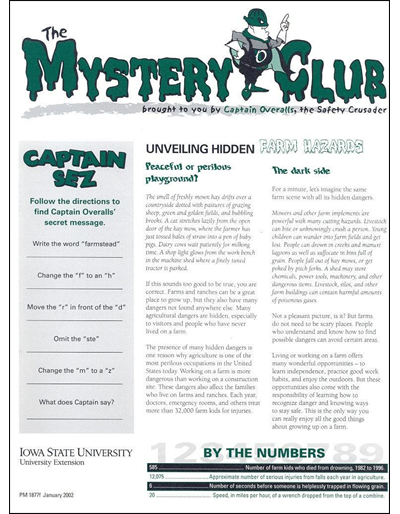 Farm safety newsletter and activities for youth, focusing on tractor safety, brought to you by Captain Overalls, the safety crusader. 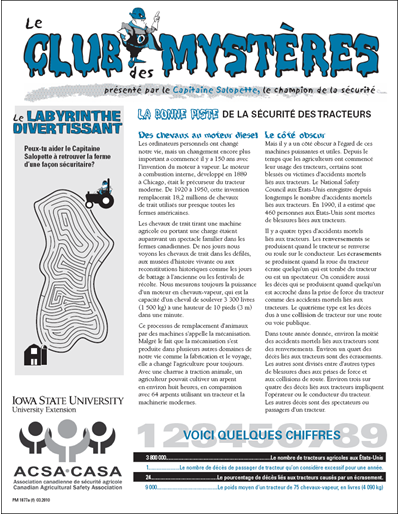 La Bonne Piste de la Sécurité des Tracteurs - Le Club des Mystères | French version of "The Mystery Club"
Farm safety newsletter and activities for youth, focusing on livestock, brought to you by Captain Overalls, safety crusader. 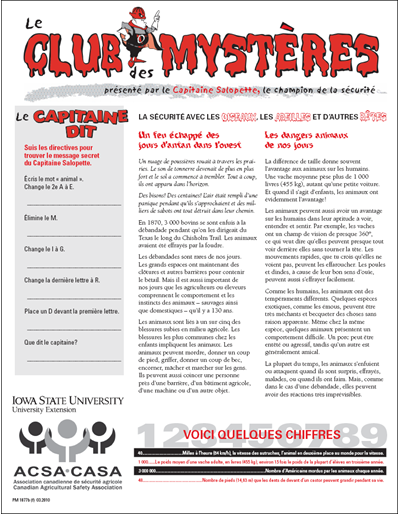 La Sécurité Avec les Oiseaux, les Abeilles et d’Autres Bêtes - Les Club des Mystères | French version of "The Mystery Club"
Farm safety newsletter and activities for youth, focusing on chemicals, brought to you by Captain Overalls, safety crusader. 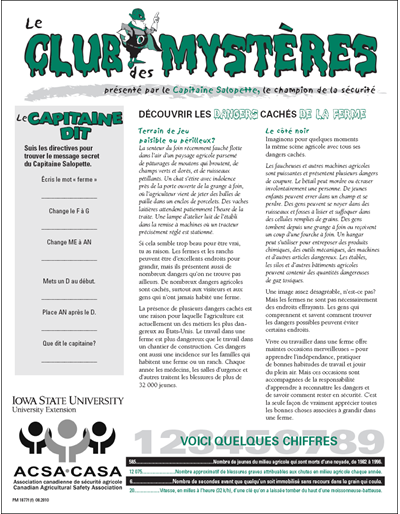 Les Produits Chimiques : le Bon, le Mauvais et le Mortel - Le Club des Mystères | French version of "The Mystery Club"
Farm safety newsletter and activities for youth, focusing on accident response, brought to you by Captain Overalls, safety crusader. 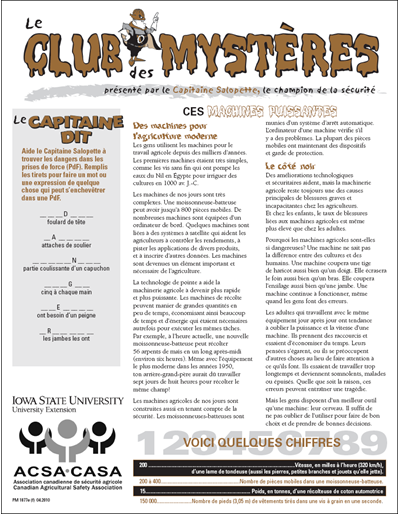 Les Accidents à la Ferme : Qui Vas-Tu Appeler? 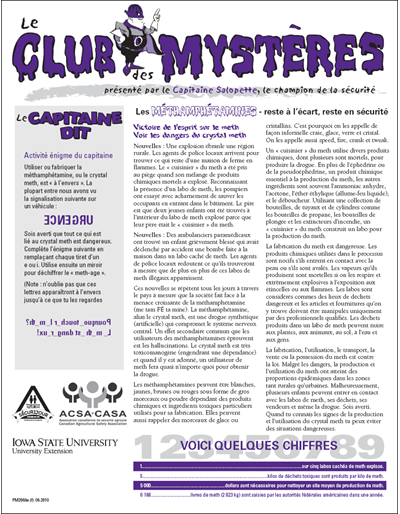 - Le Club des Mystères | French version of "The Mystery Club"
Farm safety newsletter and activities for youth, focusing on farm equipment, brought to you by Captain Overalls, safety crusader. 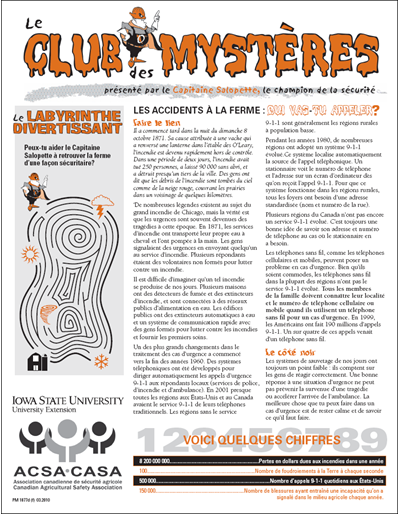 Découvrir les Dangers Cachés de la Ferme - Le Club des Mystères | French version of "The Mystery Club"
Viewer guide, with four activities, to increase personal and community action to prevent farm injuries. 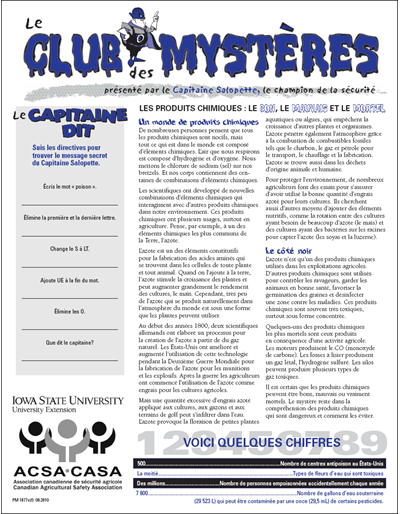 French version of PM 2069A: Captain Overalls, the safety crusader, brings important information on meth to youth. 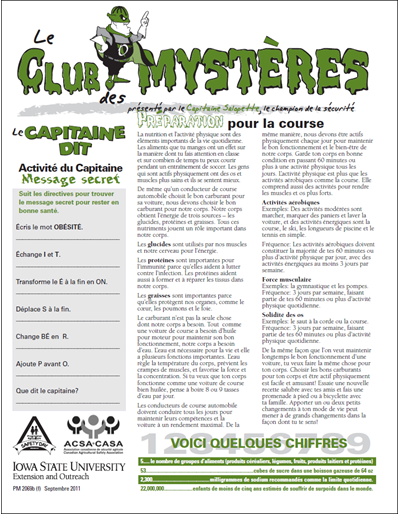 Préparation pour la course - Le Club des Mystères | French version of "The Mystery Club"
French version of PM 2069B: See what Captain Overalls, the safety crusader, suggests you do to safely and nutritiously fuel your engines for your best performance at school, at home, or anywhere. Find out how to calculate the calories you need to fuel your daily activities.